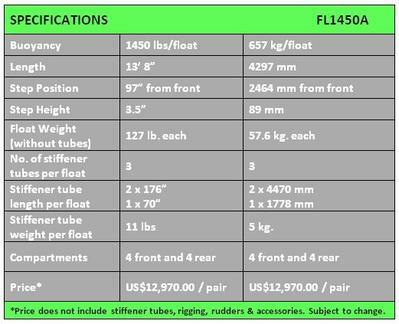 A pair of FL 1260A floats will support an aircraft with a gross weight of up to 1260 lb. (572 kg.). The 4-wheel amphibious gear-system installed on the FL1260A is smaller and lighter that the system used in the larger FL1450A and FL1650A floats. AFM ships Full-Lotus floats factory-finished (ready for inflation). The wheel system on the amphibious models is not installed: it will require final assembly and installation (along with the required Stiffener Tubes and Rigging). Assembly instructions and all hardware for amphibious gear is included. Amphibious floats typically move the CG of an aircraft forward. Aircraft with a very forward CG before floats may require ballast to off-set this. Aircraft performance will vary depending on aircraft weight and design, available power and propeller used (as well as weather & surface conditions). All Specifications are approximate and subject to change.